BBC NEWS | UK | Is there still room for Woolies? Is there still room for Woolies? Woolworths has been a cosy High Street presence for nearly 100 years, but does another poor Christmas spell doom for the retail chain? Christmas is big for Woolworths. The retailer, which has more than 800 UK stores, makes around two-thirds of its sales in the run-up to the festive season, analysts say. Last year, the chain hoped to boost sales with a sparkly advertising campaign featuring boy band Westlife. So there was some surprise when Woolworths issued a profit warning in the first week of December, before many people had drawn up their Christmas lists. And on Wednesday it announced like-for-like sales, which ignore the effect of new stores, fell 4.6% in the six weeks to 13 January. Nick Gladding, a senior retail analyst at Verdict Research, believed December's profit warning was a bad sign. "Woolworths is no stranger to profits warnings, but to issue one so early in the Christmas season suggests a deepening crisis at the embattled retailer," he commented. He said the retailer was "struggling to make a profit each year," adding, its "fundamental problem is that it is being forced to run just to stand still". In September, Woolworths blamed a "tough market" as it reported like-for-like sales fell by 8.3% in the six months up to 29 July. Losses widened to £64.9m from £20.2m a year earlier. Mr Gladding said since Woolworths split from Kingfisher in 2001 there had been many initiatives and it had simplified business, including disposing of its underperforming big W stores and MVC music business. However, he said the retailer was hampered by several problems. "Woolworths has so many competitors," he said. "It has competition from supermarkets, Tescos in particular, which it is taking on a lot more directly as they sell houseware, toys and electrical goods and other products which may be sold as gifts." He said Argos was another competitor, which was increasingly promoting its Christmas range, as well as internet firms. Mr Gladding said Woolworths' High Street location was not helping as it faced challenges from large out-of-town supermarkets. "It's a retailer designed for a different age," he said. "In a small space it is selling a lot of different products." 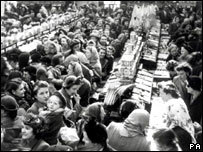 However, for years it was Woolworths' variety of products in a convenient High Street location which drew customers. The first UK store opened in Liverpool in 1909, as a subsidiary of America's FW Woolworth Company. Frank Winfield Woolworth's firm was one of America's original 'Five and dime stores', selling discounted general merchandise. In the UK, keeping prices below sixpence (two-and-a-half-pence) was Woolworths' main aim during the 1930s. Jean Figures, 80, fondly remembers going into Woolworths in Bradford city centre as a young child. "It was a three-penny and six-penny store," she said. "It was a well-known place that everybody used to go to and it sold everything." "I remember my aunt taking me there when I was about six or seven to choose an Easter egg. "We were very poor in those days, but I picked this great big Easter egg, which probably had paper thin chocolate compared to the smaller ones. It was sixpence as nothing cost more than that there." 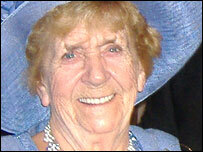 Mrs Figures also worked in Woolworths as her first job in Birmingham after moving to the city in 1945. "I started on the record counter although once a fortnight was on the sweet counter," she said. "It was still rationing then - there were sweet coupons, and I think they were worried you would otherwise get to know people and give them extra sweets." She said the shop was in the heart of the shopping area in Birmingham's original Bullring and outside shopping carts sold hot chestnuts, roast potatoes and other delights. 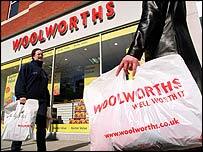 Woolworths has seen numerous changes since its early days, including its acquisition by Paternoster Stores Ltd, the forerunner of Kingfisher plc, in 1982. Woolworths Group plc began trading as a listed company in 2001. But some analysts now accuse the retailer of being old-fashioned and lacking identity. A Woolworths' spokeswoman said since it demerged from Kingfisher, the retailer has followed a "kids and celebration" direction, aiming to specialise in seasonal products such as at Easter, Christmas and Halloween. She also pointed to the success of Woolworth Group's entertainment, wholesale and publishing division, made up of Entertainment UK (EUK) and 2Entertain, a joint venture with the BBC. Investment bank Morgan Stanley's report on Woolworths Group said this division now accounted for nearly three-quarters of group profits. Woolworths said over Christmas 2Entertain benefited from DVD sales of natural history series Planet Earth. The spokeswoman added Woolworths would continue to work to make sure its shops had the best products for customers, while the internet and its Big Red Book catalogue, which had contributed to festive profits, were likely to drive sales this year. However, Mr Gladding said the retailer faced "a very difficult future". "There is a limit to how long a company can continue to under perform," he said. "Competitive pressure will intensify in the future, particularly pressure from grocers selling non-food items." "Despite this trading update, Woolworths' long-term viability is still far from assured and the break up of the group remains a possibility."